I have spent many days in spring and fall at Cabot Head, enjoying this beautiful place with bird migration in full force, the renewal of spring, the slowdown of fall, the many moods of Georgian Bay. There is one aspect of Cabot Head that I am not very familiar with, though, and it is wintertime. The first snow may fall before I leave in early November. And sometimes, the last snow surprises us in spring: I remember white days in early May certain years. But the deep freeze and silent whiteness of winter are not part of my mental map of Cabot Head. So, this winter, I decided to visit the station and expand my experience. Despite the yo-yo El Nino winter, snow covered the Peninsula, in stark contrast to my winter home in Guelph (which has seen a constant see-saw of green and white). I did two visits to the station this winter, one in mid-January for a day, the other just recently, in early March, staying two nights in Wingfield Cottage. Snowmobilers travel frequently on the Cabot Head road to visit the lighthouse, so the snow is usually well packed and there’s no need for snowshoes. It is an easy 2 hour hike from the start of the dirt road to the station. The snow-covered land provides an open book for all the walking critters of the wood. It is impossible not to leave a track on the snow blanket. On my first visit, there were otter tracks all along the road, sometimes parallel to the road, sometimes heading to the bay, always easy to identify with the belly marks that otters leave when they slide down on their bodies. When I arrived at the station, Wingfield basin was half frozen and just at the edge of the ice, there was an otter! Swimming and diving in the frigid water, it was fishing and hauling out on the ice from time to time to consume its catches. We shared lunchtime together, me on the porch taking in the feeble winter sun, the otter on the ice certainly perfectly warm in its dense fur. Otters were almost as coveted as beavers during the era of the fur trade, with the same dire consequences on their population. It is nice to see that their numbers have rebounded, along side the engineering beavers. At Cabot Head, there are definitively healthy families of beavers and otters, often observed around the shipwreck Gargantua in Wingfield Basin. My second winter foray to Cabot Head – in early March – was a bit more ambitious, with my intention of staying overnight for 2 nights. Besides lugging a big backpack full of food, it was actually quite an easy stroll under a much stronger sun. Easy to set up “camp” as well: the station is always closed for the winter, so there’s no power or plumbing, but the propane stove could easily be turned back on and Georgian Bay water works fine. Tracks were abundant, making for a lot of fun reading. There were otter, grouse, the big furry pads of snowshoe hare, deer, and more. There were some fisher tracks as well. And sometimes, one may see the tracks being made in real time too! We were lucky and delighted when a fisher walked down the path towards us, in its smooth, mustelid way. When it noticed us, it quickly bounded off trail and into the woods. The change of gait was very obvious when we examined the very fresh (!) tracks. Silence and whiteness are the obvious attributes of winter at Cabot Head. Very few birds are hardy enough to stay in winter: the fiery chickadees; the croaking ravens; the regal bald eagles (as long as there’s open water!). As dusk deepened on my first evening at Cabot Head, I caught the silhouette of a ruffed grouse high up in the bare branches of a maple, oddly and delicately balancing on twigs to eat buds. It was a dance I never witnessed before and an illustration of the difficult winter diet of these birds. 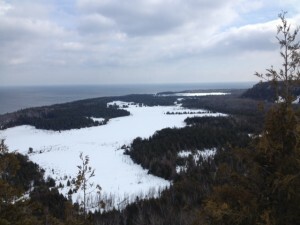 On March 6, I went for a nice snowshoe hike to the top of West Bluff. 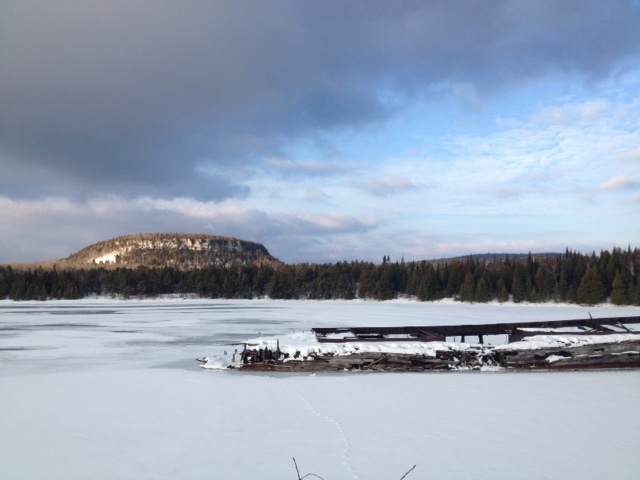 It was wonderful to gaze down at a winter landscape, with frozen lakes, bare trees, a white and black world. But, as I should have expected, Cabot Head always has some surprises. As I was standing near the edge of West Bluff, a big bird suddenly took off and flew away: an adult Golden Eagle! It was a magnificent sight of a rare bird and another indication, if necessary, of the richness of Cabot Head, and by extension, of the Bruce Peninsula. Now, I am even more eager to return to the Cabot Head Research Station for the spring bird migration monitoring, to experience the renewal of nature, the return of warblers, the greening of the earth. I am also richer now with memories of a white Cabot Head, images of winter to juxtapose with my spring and fall ones. 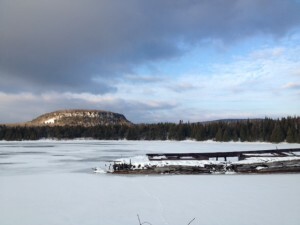 great of you to share your love of winter outdoors in a wonderful space – Cabot Head. Thanks for sharing this adventure, and you passion for nature! You’ve described your experiences so well that I feel I was there! Thanks very much for telling us about winter at Cabot Head.